Looking for the perfect holiday gift? Place your order by December 20, 2013 to receive an emailed Certificate of Purchase or emailed Gift Certificate. This week’s “Back-Up of the Game” presented by Venyu is wide receiver Griff Whalen. Jim Irsay’s tweet announcing a roster move might have caught some by surprise on Saturday morning. Roster moves usually don’t come at that hour and even the player being elevated to the active roster was a bit surprised. “I really didn’t know anything. Nobody said anything to me, so it was kind of weird,” Whalen said of elevation. Whalen had four catches for 45 yards and his 18-yard touchdown on the initial drive was the Colts first opening half touchdown in nearly two months. Not only did Whalen play 35 offensive snaps on Sunday but he also served as the team’s punt returner with a 51-yard return (season long for the Colts) in the third quarter. When LaVon Brazill was a late scratch, Whalen was called on to serve in “Next Man Up’ duty. “When you look at the roster, we know the roster is fluid and things like that happen and you have a choice to make when that happens to you,” Chuck Pagano said of Whalen’s performance. “Certainly Griff’s not one of those guys that would go in the tank, so to speak. He’s a grinder. He plays with a chip on his shoulder. He’s got something to prove, obviously, and he’s not one of those guys that got away from doing the things that you need to do in order to have another opportunity, which he had, and then take advantage of it. Colts.com takes a deeper look into the Colts offensive and defensive success versus the Texans and some interesting snap breakdown analysis on both sides of the ball. 1. In converting their first five third-down chances, the Colts were tremendous in getting in “manageable” situations versus the Texans. The five conversions came on plays with 3, 1, 1, 6 and 2 yards to gain. Later in the week, Colts.com will look at how the Colts were able to get into these advantageous positions. 2. In getting off to a vital 20-3 first half lead, the Colts had their first six opening half possessions penetrate Texans territory. A pair of Darius Butler interceptions certainly helped this cause. 3. Trent Richardson said two weeks ago that he was feeling the best he had felt since coming to Indianapolis in mid-September. Richardson backed that up with 34 touches for 190 yards (5.6 yards per touch). Richardson played 49 of the team’s 70 offensive snaps on Sunday with Donald Brown leaving the game early due to a stinger. 4. Coby Fleener did not record a catch on Sunday for the first time in 2013. Fleener was targeted just once on Sunday. Since the bye week, Fleener had been averaging a little over four catches and 56 yards receiving. 5. 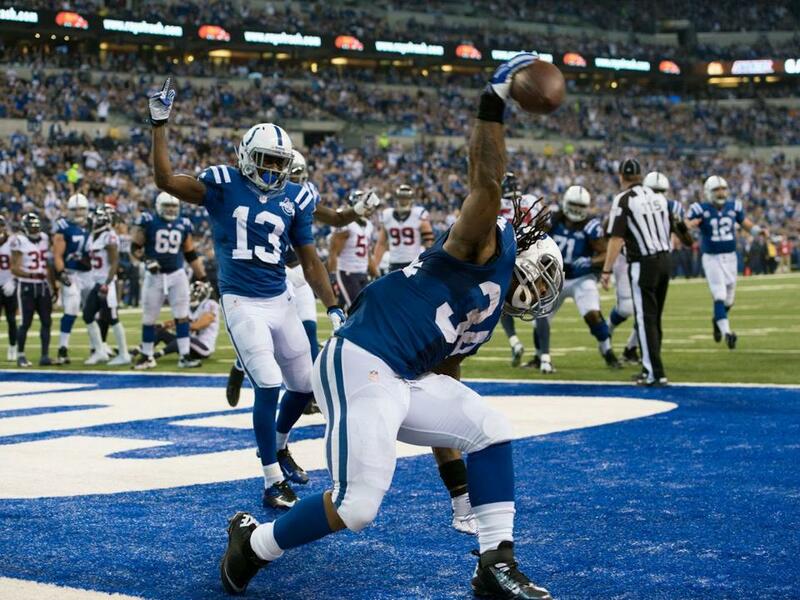 Hats off to the Colts secondary duo of Antoine Bethea and LaRon Landry. The duo racked up 13 solo tackles in playing all 65 defensive snaps. It was the best performance the Colts secondary has had since the win over Denver. All-Pro Andre Johnson had just 18 receiving yards, his second fewest since 2006. The wide receiver breakdown was: T.Y. Hilton (59), Da’Rick Rogers (56), Griff Whalen (32) and Darrius Heyward-Bey (13). Without LaVon Brazill, we saw Rogers and Whalen’s numbers rise significantly. DHB added six special teams snaps, once Sergio Brown went down with a groin injury. The tight end breakdown was as follows: Coby Fleener (57), Jack Doyle (36) and Weslye Saunders (23). With a beat up receiver corps and no Stanley Havili, Doyle and Saunders played significant snaps. With Joe Reitz (11) exiting due to a concussion, rookie Xavier Nixon played (61) at right guard in just his second NFL game. Nixon is more of a “swing” tackle according to Chuck Pagano but was forced into the interior with Reitz, Jeff Linkenbach and Samson Satele all out. Without Pat Angerer, the inside linebacker position was manned by Jerrell Freeman (65), Kelvin Sheppard (32), Kavell Conner (16) and Josh McNary (15). In the secondary we saw Josh Gordy (33) play the nickel position as Cassius Vaughn (0) was the team’s kick returner without Chris Rainey. Intro: Indianapolis gained momentum with a 25-3 win over Houston, the club’s second-largest victory margin of the year. The Colts grabbed the lead from the outset and did not need any comeback in assuring an 18th winning season in Indianapolis. INDIANAPOLIS – Three of the Colts’ previous eight wins needed fourth-quarter comebacks, and the club had not earned an advantage larger than one score since November 14 at Tennessee. Indianapolis had been plagued by slow starts in the last six outings but ended all of that by scoring early and building a 17-point halftime margin in a 25-3 win over Houston. The Colts gained a measure of momentum heading into a week 16 showdown with 11-3 Kansas City, a possible playoff foe. The Colts were the only AFC division leader to win last weekend, and here are FIVE THINGS LEARNED. RESERVES TRAIN LIKE STARTERS – Chuck Pagano and his staff have said numerous times that reserves train like starters. Trent Richardson yesterday credited the scout team (comprised also of practice squad players) for providing great ‘looks’ in practices that only help hone the starters. Joe Reitz, Fili Moala, Griff Whalen and Darius Butler figured to get heavy work Sunday. Tackle Xavier Nixon did not, but he went in early for Reitz at RG and played the duration of the game after never having played the position before. With Reitz starting at RG, the Colts were using their sixth different opening configuration. His early exit with a concussion almost makes this count as a seventh different opening bunch. Cassius Vaughn and Darius Butler have split starting time for Greg Toler, and both had multiple interceptions in the Colts’ last two wins. Credit coaches, credit players, but give credit when looking for one way how the team won Sunday. EARLY ADVANTAGE, EASIER PLAY CALLS – Andrew Luck said the faster start yesterday made “a world of difference.” Pagano said it opens things up on both sides of the ball and makes calls easier because the outcome is not hanging in the balance with so much time left on the clock. The Colts won late against Oakland, Seattle and Houston, while making plays down the stretch to subdue Denver and Tennessee (twice). San Francisco (27-7) and Jacksonville (37-3) were the only real wide-margin days for a battling Colts club. It’s not that yesterday didn’t have stress, there was just less of it by finding a rhythm, getting an advantage larger than one score and finishing out an opponent. RICHARDSON UNSELFISH – Trent Richardson lined up in different spots in the offense. He did so at blocking back. He works hard enough during the week when moved elsewhere that he wants to contribute as a receiver. He has caught nine passes in the last two games, and yesterday he produced a season-best 102 scrimmage yards. His adaptation to the offense has had fits and starts. Yesterday was a good day for Richardson, and he needs to remain a building block. POINTS A PREMIUM – Yesterday’s 25 points could have been more had a handful of chances been cashed in better. A red zone turnover early led to Houston’s lone score. Takeaways that started possessions at Houston’s 17 and 44 produced field goals. Those happened in the first half when Indianapolis still built a 20-3 lead. 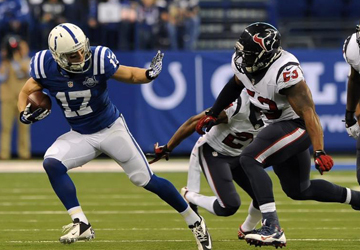 Later, a long punt return set the Colts up at Houston’s 28, but a field goal was the result. Pagano cited these afterward as points left on the field. It did not bite harshly on Sunday, but there are other Sundays looming. DEFENSE WAS NEARLY AIRTIGHT – Houston’s only points came off a 32-yard drive that only produced two first downs. The next 11 defensive possessions for the Colts ended with seven punts, two takeaways, a turnover on downs and a sack-strip-safety. Those 11 possessions netted nine downs for the Texans, while the Colts pitched first-down shutouts on five straight possessions just after halftime. Indianapolis held Houston to 16 yards on 10 plays in the third quarter. It was an overall performance that included four sacks, a two-thirds failure on third downs (the best since week five), 12 first downs and 26:49 possession time (the season’s third-lowest mark). Well done.